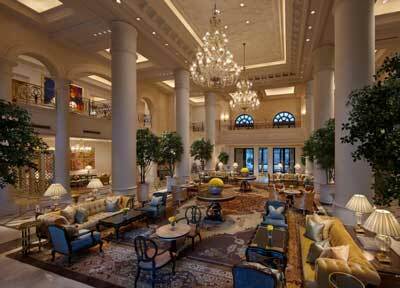 Lobby of the Leela Palace, New Delhi, India (photo courtesy of Leela Hotels). Leela Palaces and Resorts are bastions of elegance and comfort in some of India’s most desirable locales. Each of these India hotels offers more than just a regal and refined setting—they offer gracious and anticipatory service that truly delights guests. Tucked away in seven acres of verdant gardens and a glittering lagoon, the Leela Palace in Bangalore is a grand getaway that blends a rich Indian heritage with modern comforts. Inspired by the Royal Palace in Mysore, the hotel’s 357 guestrooms radiate with luxury, and the amenities—such as a deluxe spa and state-of-the-art fitness center—only add to the appeal. This is a superb place to stay in the Garden City. The Leela Palace is the only seafront city hotel in Chennai, and its singular qualities don’t end there. Perfectly placed where the Adyar River meets the Bay of Bengal, the hotel’s 326 rooms and suites represent the epitome of elegance. The architecture recalls the glory of the Chettinad Dynasty, but you’ll be reminded that you are in the heart of a bustling modern city: the hotel is conveniently located close to the central business district and other local attractions. Feel the spirit of Goa at the Leela, a 75-acre beachfront oasis. Designed to reflect to Portuguese and Indian heritage of this captivating region, the Leela’s 206 luxuriously appointed guestrooms and suites are just the beginning of the treats that await you here. Play a round on the 12-hole golf course, enjoy spectacular meals prepared by a superb chef or simply soak in the sun on the pristine beach. Allow this gem on the Arabian Sea to entrance you, and prepare for the ultimate beach holiday in Goa. Conveniently located on the cusp of the Gurgaon Business District, this hotel is worthy of the many awards it has won. From the three exquisite restaurants and the heated infinity pool to the superlative spa services and the delightful appointments of the 322 five-star rooms and suites (not to mention 90 fully serviced one-, two- and three-bedroom luxury residences), this hotel sets the bar for luxury in Gurgaon. Set on a cliff overlooking postcard-perfect beaches, the Leela Kovalam’s location is reason enough to stay here. Luckily, that is just the beginning of its charms. This luxury resort is renowned for its impeccable service, attention to detail, top-notch cuisine and impressive accommodations. The hotel is also just a short distance from the Trivandrum International Airport, making it exceedingly convenient. A verdant oasis in the heart of Mumbai’s commercial district, the Leela Mumbai offers discerning travelers an elegant escape amidst the bustle of one of India’s most exciting cities. The hotel offers delightful touches like elaborate gardens and cascading waterfalls outside, and contemporary comfort and effusive opulence inside. The 390 guest rooms here are exquisitely decorated, the dining is world class and the spa offers a thoroughly indulgent place to unwind. Ideally located near the Prime Minister’s residence, the Secretariat, the central business district and historical monuments, the Leela Palace New Delhi teems with grace and elegance. The spacious (550 square feet and above) suites and guestrooms here were created with meticulous attention to detail, and the overall imposing architecture of the hotel—inspired by the work of the legendary Sir Edwin Luytens—makes this one of the most impressive hotels in all of Delhi. The chic restaurants and indulgent spa only add to what is an excellent experience. With an idyllic location on shimmering Lake Pichola—not to mention the striking views of the Aravalli Mountains in the distance—the 80-room Leela Palace in Udaipur is perfectly placed for those wishing to soak up the beauty of the city and its surroundings. Inside, the opulent rooms and suites are enhanced with graceful elements reflective of Rajput design and artistry. In addition to an array of splendid restaurant and lounge options on site, the Leela offers a spa and a lake-facing pool to complete the experience. This is a fairy-tale setting within which to relax and enjoy Udaipur’s charms. These hotels are suggestions of properties that can be included in a tour to India. We will be happy to customize an India itinerary to include Leela Hotels where possible and to mix with other properties. Contact Geringer Global Travel at 877-255-7438 or email us at info@geringerglobaltravel.com to discuss how we can create a personalized luxury India tour for you.